Here in Canada, it’s usually about this time of year when we start to crave warm summer days. 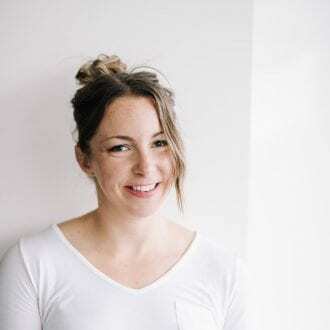 Even though we’re well on our way to spring here on the West Coast, I’m still dreaming of summer days and with that, I bring you Lime Coconut Energy Bites. Dedicated to summery cocktails, lazy days at the beach and warm summer evenings everywhere. Refreshing, delicious and most importantly, ready in just 5 minutes. 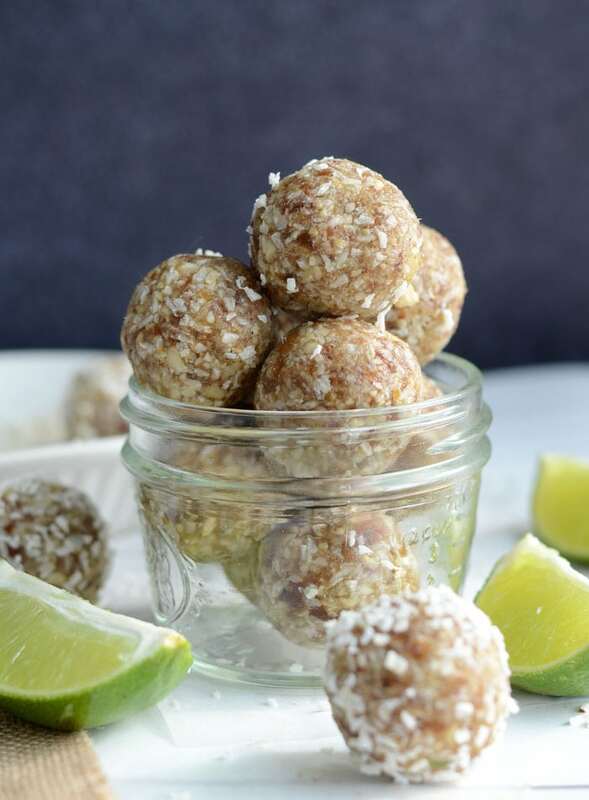 Lime and coconut is a delicious combination for energy bites but if you don’t have any lime on hand, these are just delicous without it too! You could also substitute lemon or orange juice for a citrus twist, or even lemonade! 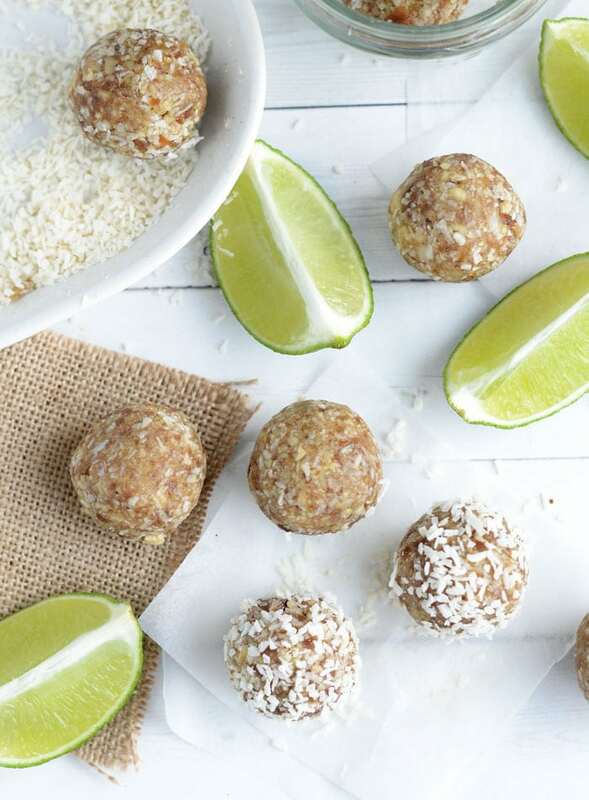 You can go ahead and adjust these lime coconut energy bites to make them your own. If you’re short on cashews, bump up the coconut, if you’re short on coconut, bump up the cashews. This is more of an energy bite guideline than a recipe. Feel free to adjust to your taste preference or whatever you have on hand. You can also use raw almonds in place of cashews. Maybe you’re not feeling tropical at all? Try one of these other yummy energy bite recipes! 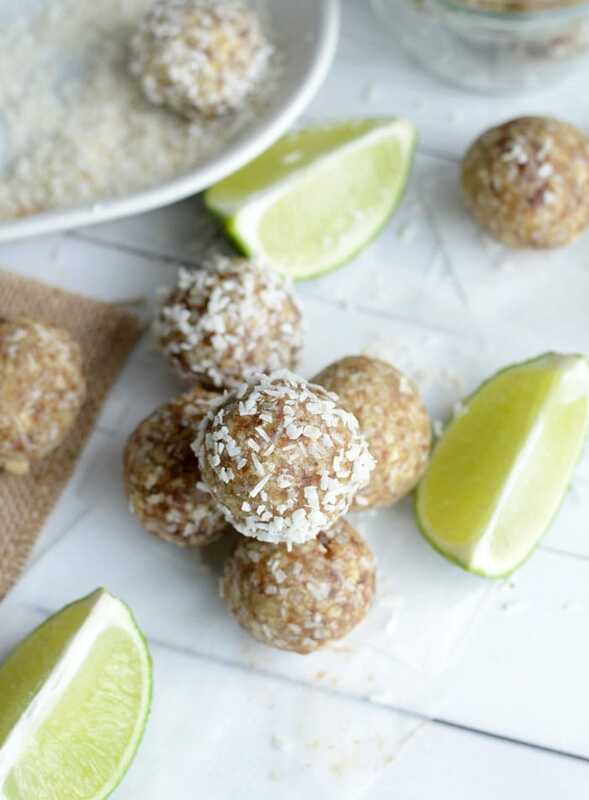 If you are feeling like some tropical, refreshing lime coconut energy bites, let’s get down to it! All you need is raw cashews, fresh dates, unsweetened coconut and a lime, it’s so easy! 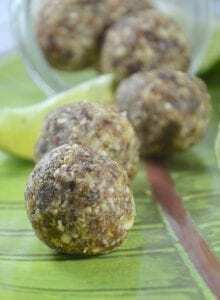 Blend it all up and roll into balls and you’ll be in lime and coconut heaven in just about 5 minutes. 4 simple ingredients, plant-based, no-bake, gluten-free, no added sugar – just real food! Place the cashews in a food processor and mix until mostly broken down. Add the coconut and lime and process until well mixed. These look amazing! I just might have to try them VERY soon! Thank you! I found this on Pinterest. What a great idea! Do you think you could substitute a different type of nut instead of cashews? I’m wondering if almonds would work. Thanks! You can definitely substitute almonds, I’ve actually made with both and they’re good either way 🙂 Enjoy! YUM! I have never thought about using lime juice!! Delicious! These look so so good! I am thrilled it’s the weekend, because I cannot wait to try these! I just made them, and they are DELICIOUS! I mixed in some roasted pistachios and almonds with the cashews to give more variety in the nuts. Thanks for posting this recipe! If we use pre-made cashew butter would it still be 1 cup? Thanks! I’m not sure it would work with cashew butter, you need the nuts to be solid still. You could try looking up a recipe for homemade cashew butter and see how much 1 cup of cashews makes, then adjust from there but I think it will be too soft. Dude. We may need to go into business together and put together ‘The Ultimate Snack and Energy Bites Cookbook’ – seriously!! I’m loving the tropical feel of these – and I’m dreaming of the beach! SO delish! I made these this weekend with a little extra lime juice and a splash of vanilla, and they are fantastic! They’ll definitely be in regular rotation in my kitchen. Thanks for sharing! I just made these and they are lovely. I could see rolling them in crushed pistachios, or even a few hemp seeds to up the protein. Or drizzled with chocolate. Or just eaten straight from the food processor by the spoonful. Oh crushed pistachios would be delicious! Great idea! It would look pretty too 🙂 I love eating it straight from the food processor, lol…mmmmm. Thanks for letting me know! Would love to try these but I am not sure what raw cashews are exactly, can you explain? Also are there only one kind of dates(I have never eaten them before). Holy crap! These are delicious! So happy you liked them, Carla! yummy wow my mouth is full of water after seeing this :p good work. I made these with almonds and sweetened coconut because it’s what I had on hand. They are amazing! Awesome. Good to hear they were okay with almonds, a few people have asked but I haven’t tried it. Thanks! These are sensational , thanks for the recipe , yummy……. Yum! These are so delicious and so easy and quick to make. I have made a variety of different recipes like this but they never turn out quite right or take awhile to do but these are so quick and the best I’ve had. I have handed them out around work as well and everyone is loving them! A nice little mid morning or afternoon snack. So glad to hear that! I love these too, so quick and easy and they taste so good! Just wondering if they would freeze ok. I want to make them for Christmas gifts. Ya, you can freeze them for months! Enjoy! 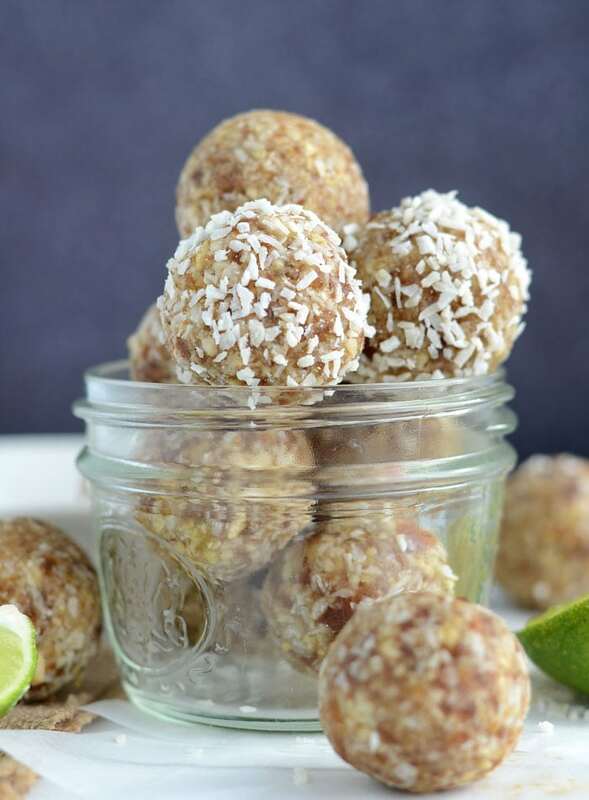 These lime coconut energy balls are delish. 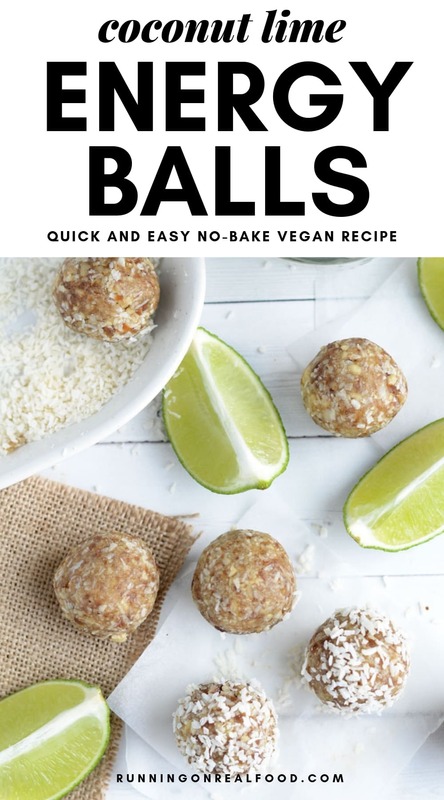 Easy recipe and a nice change from chocolate nut butter type energy balls. So glad you liked them! I love them too, so fresh and yummy.